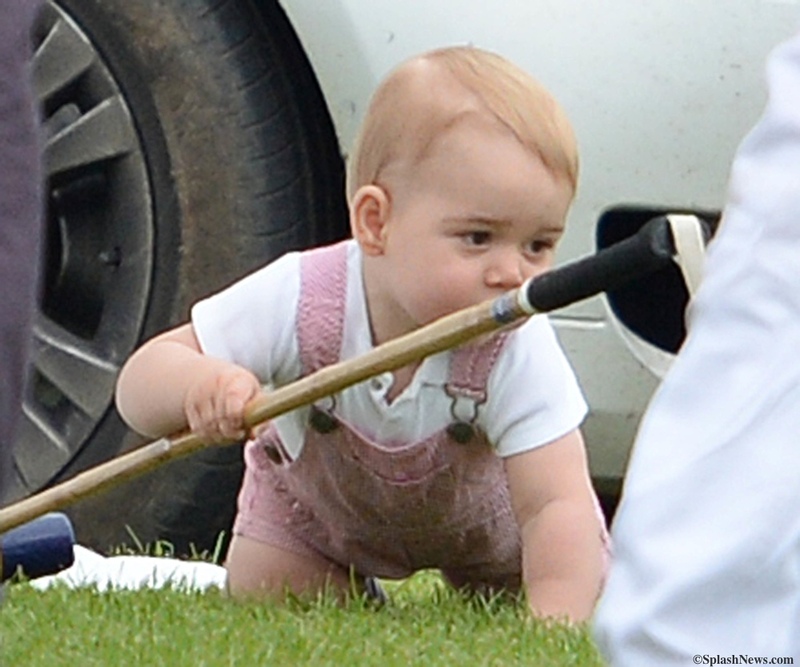 Kate was casual today as she brought Prince George to watch his father play polo. The young Prince was in attendance as his father and Uncle Harry took part in a match at Cirencester Park Polo Club this Father’s Day. The event was a fundraiser for Centrepoint, Prince William is the charity’s royal patron. More from Simon Perry’s story in People magazine. William was helping to raise money for the homelessness charity Centrepoint, for which he has been a patron since 2007, following in the footsteps of his late mother Princess Diana, who took her two young sons to see homeless shelters before she died in 1997. Two other charities – Well child, which Harry supports, and Child Bereavement UK, another of William’s causes – were also beneficiaries. 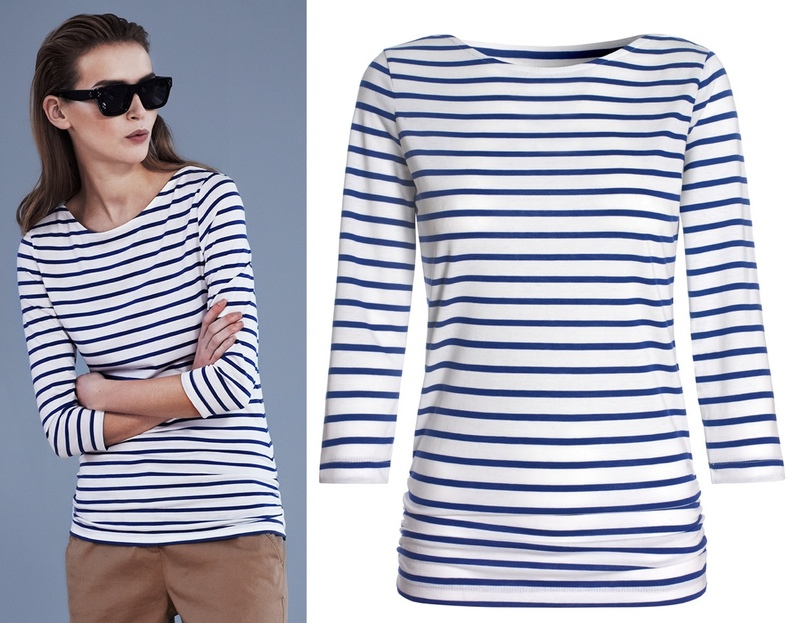 Kate was in her Breton stripe top from Me + Em (£48). If interested in’repliKating’ this style we do have a few possibilities on our ‘CopyKate Clothing‘ Pinterest board. 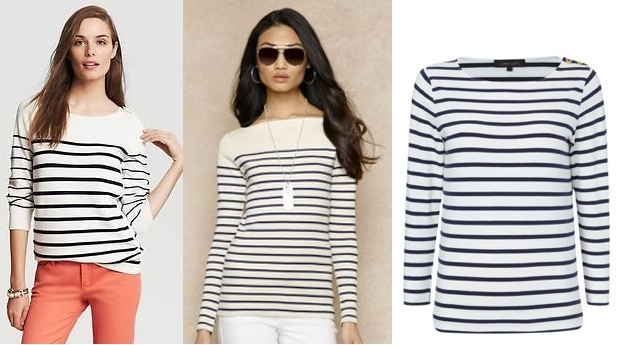 Some of those include the Banana Republic Nautical Stripe Pullover ($69.99) the Ralph Lauren Striped Boatneck Top in cream/windigo ($54, shipping is free), and Jaeger’s Button Shoulder Breton Stripe Top at House of Fraser (£60, about $100). Kate also wore her Sebago ‘Bala’ boat shoes. They appear to be well-stocked on the Sebago site ($95), as well as on other sites, like Online Shoes ($75.99). The Duchess wore little jewelry today, only her Ballon de Bleu watch by Cartier and her sapphire/diamond engagement ring. 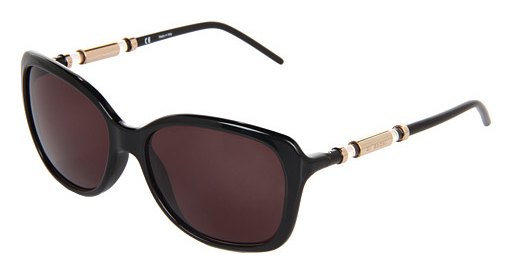 Kate was wearing the Givenchy ‘Obsidian’ sunglasses we have seen previously; the style number is SGV 773, be advised the glasses are no longer available at reputable dealers I could locate. There are plenty of online sites offering the style, but they appear to be store selling counterfeit merchandise. I’ve not yet sorted out an ID on Kate’s skinny jeans, but will update when there is more information to share. Prince George also wore things we’ve seen before. 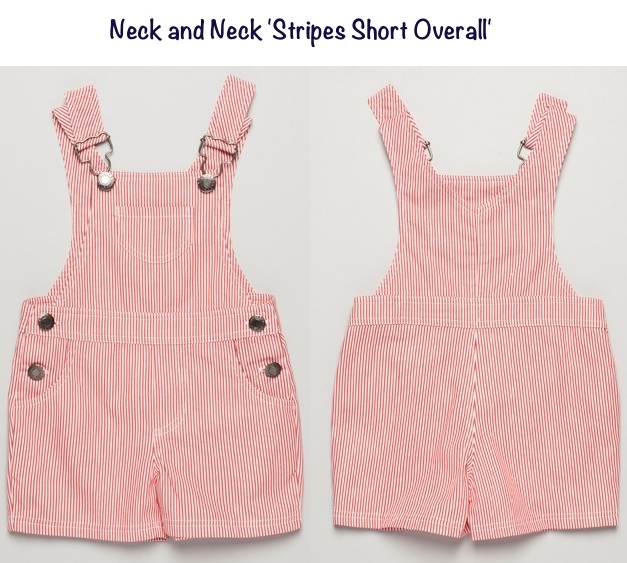 He had on his Neck and Neck overalls, no longer available. The young Prince looked as if he wanted to play alongside his father and uncle. And he looked well on his way to walking without assistance from anyone. 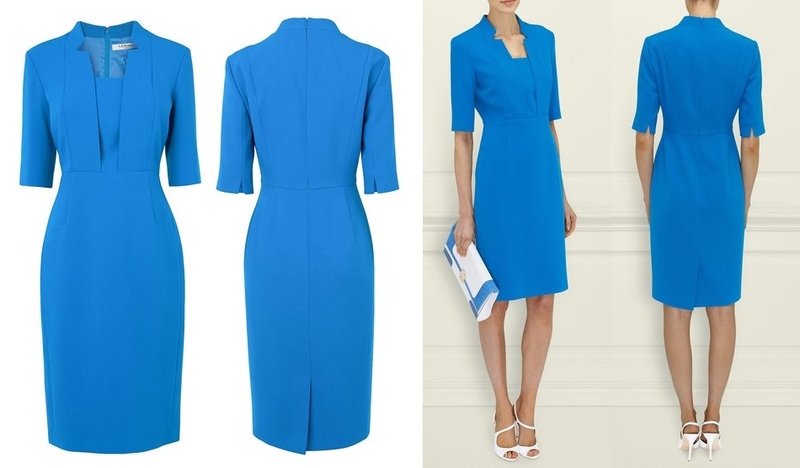 A quick restocking note: the LK Bennett Detroit dress is back in stock on both the US website, as well as the UK/International site. Next appearance: We expect to see the Duchess tomorrow for Order of the Garter ceremonies. He is so cute and Kate looks so happy with her beautiful boy. I personally LOVE bretons, and I love how they look on, so I get why she wears them all the time. I selfishly wish she wore stuff with a little variety, but I can’t mad at the woman for wearing what she likes! I have wanted a pair of boat shoes like those for some time–does anyone know if they’re comfortable? I don’t know if I’m a fan of Sperrys. I agree completely. It is fun when she wears something new, but being a lover of stripes and a “uniform,” I can’t fault her for the same. lol I do have a pair of similar shoes that, no kidding, I have owned since1992 and they are still comfortable, look good, and people ask me where I got them. Spend a little more on them, so that they last. You will find yourself living in them, especially in fall and spring. Rue La La has Kate’s Sebago Bala boat shoes on sale for $24.90 right now! They aren’t available in the color she has, but there are some other options. I bought my pair yesterday in the gray/white with metallic sheen. My how old many of these comments sound. She is a young woman with great legs – let her wear skinny jeans. She’s already had to lower her hems to frumpy lengths – the difference is quite clear in the order of garter pix. I agree that jackets with jeans is a great look – almost a uniform for many people of both sexes. And wedges are fine with skinny jeans — heels are another matter, but she’s not doing that. Frankly I find her fashion style is becoming a bit ordinary. Whether she has lost her confidence or others are sitting on her hard to say but doesn’t seem to have the sense of herself and her own style she used to. I don’t love when she wears skinny jeans with little blazers, admittedly. But I agree that this situation is the perfect occasion for them. There is nothing wrong with wearing them to a casual event like this one. Looking back on her earlier looks, she has always had a tendency to wear a lot of similar items. When she was younger, it was a bit more Bohemian, but it all looked quite similar. She seems to like a uniform (as I said above). And, as a mom and someone who is constantly having to mix and match- and is concerned about criticism of over-spending- I don’t blame her. I don’t mind the skinny jeans for non-official engagements. This casual look for a private family outing is perfectly fine, I think. Prince George is such a beautiful child!! Does anyone else think his coloring really stands out and is rather unique? He seems to have darker eyes with that reddish/blonde hair, which I think makes such a gorgeous contrast! Those overalls he is wearing are so cute too, especially in the pics of him trying to kick the ball. I like the color of the jeans Catherine wore today as we almost always see her in a much darker wash of denim. I think the striped top looks like hundreds of others I’ve seen everywhere, so I would just pick one up for much cheaper. I like the boat shoes somewhat, but I prefer Toms 🙂 Catherine is just so beautiful. I don’t think she can take a bad photo and I almost think she looks prettier when she’s dressed casual because it almost enhances her gorgeous hair and face. A lot of people can look gorgeous all glammed up, but to me she’s just as gorgeous! 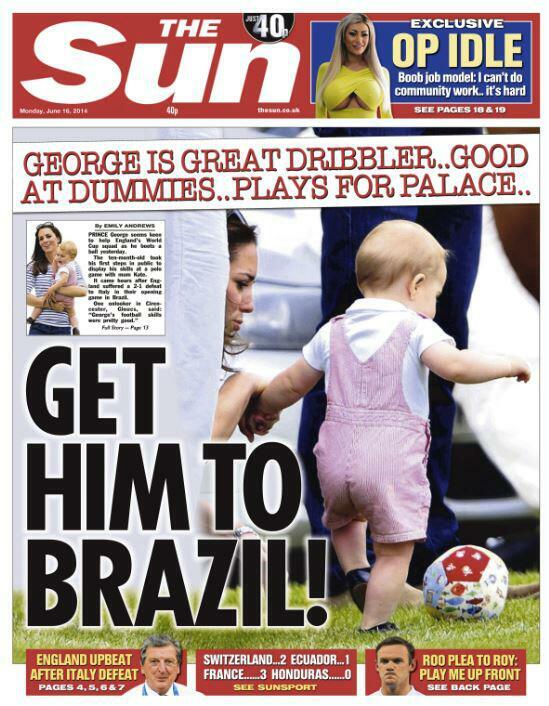 I’m pretty sure Prince George is going to be a heart breaker! Thank you Susan for your amazing coverage of the Duchess of Cambridge, I’ve been following your blog with much attention for a couple of months now and love it. What I really do not love though is those ultra skinny jeans the Duchess keeps wearing! I do not find this cut nice on anyone to be honest, and even find it a bit tacky. Am I the only one to think so? Well, the skinny jeans are what’s fashionable, and if you are slim enough to wear them, I think they’re fine. I think the Duchess likes showing off her well-exercised legs in them. The trick is to be careful about whatever else you are wearing. Skinny jeans with cropped or otherwise skin-baring tops, sky-high heels and a lot of jewelry can veer into the tacky, that’s certainly true. But with the sorts of items with which the Duchess wears them, they usually aren’t tacky at all. The only items I object to, as worn with skinny jeans by the Duchess, are the Stuart Weitzman Corkswoon wedges. The proportions always look wildly wrong to me. A lower wedge would work much better, and flats or near flats can look very good with such jeans. LOL about the Corkswoons………….I agree with that! The proportions are all wrong with those. I think they might look good with some nice tailored and looser trousers, but ultimately I guess I’m not particularly into that shoe. I’m in agreement with you, Anne B. Not at all flattering on Kate. Especially the rear-end! And I’m curious as to why Kate keeps wearing this same Breton navy/white striped shirt when I’m sure she has a closetful of other blouses that are equally (if not more) stylish? Of course, the average woman wears her clothes over and over (till she’s tired of them or they don’t fit, or become ruined), I would think since Kate is in the public eye, she would rotate some of her clothes. I’ve seen some really nice blouses from her Kate Middleton days when her and William were just dating. I just don’t understand why she doesn’t bring some of those out to wear? It’d be refreshing! I think Catherine does what many famous people do to deflate the value of photographs. If she’s wearing the same thing over and over, the photos don’t command as high a price, so when she’s not on duty and doing something on her own time, you’ll often see her rewearing previous pieces. I agree, it can get boring, but I certainly understand it, especially when you consider how ghastly some photographers are. The jeans she’s wearing in this photo are not the “skinny” jeans she usually wears; they are “straight leg” jeans, which are a bit looser than the skinny one. These are also lighter in color than her favorite skinnies. The Duchess is young and she looks good in jeans and she is at a private event. I see no reason to criticize her for wearing something that makes her happy. To answer Angie B . . . Perhaps the Duchess LIKES this top and feels comfortable in it. After all, she’s with an active baby and she needs to feel comfortable at this private event. Where do I find Angie B Jeans online? I like the fact that hers isn’t very long or tight around the ankles. 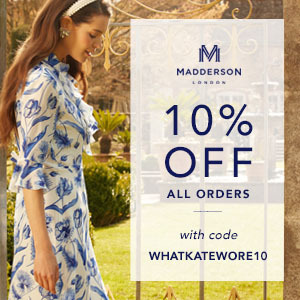 What a wonderful tip–just purchased two tops! Thanks! anyone know how the fit is for the Me+Em breton top? Is the material cotton? Wow George’s suit is so like one Harry wore when he met the Spanish royals. You’re right! I just realized that! How ironic! Glad to see the Duchess enjoying wearing her comfy clothes, she looks great in these classic outfits with navy blue, cream and tan mixed. I like very much seeing these looser style jeans on her, as I’ve never thought the skin-tight ones were very ladylike! The only accessory she needs is George. Kate looks really good in flats – instead of the wedges she normally wears with jeans. I wish we could see more of this look for casual wear. I totally agree. Flats, and that lovely Breton top, look fine with those jeans. Wedges and jacket definitely not. Great to see Kate having a (hopefully) relaxed day and to catch a glimpse of Prince George – and walking! Those wedges. Oh my goodness…not a good look. And especially worn with skinny jeans, that is the worst! Flats look so much more appropriate with skinny jeans. I don’t know what her fascination is with those sky-high wedges but obviously they are her faves. I own those wedges and they are super comfy and really dress up a casual outfit such as jeans or Capri pants/crop pants. They are not nearly as clunky looking in person as they sometimes appear in photographs. Ever since the volleyball appearance, I have adopted this “uniform” of hers, at least in a few variations! I found a Breton style shirt at Old Navy (hardly Duchess quality, I know!) I also recently purchased the Sebago ‘Balas’ as I was looking for a casual, closed toe summer shoe for work. The break in period was a bear but now they are (almost) comfy and I love the look. Adding a blazer and changing out for wedges and I’ve got a polished meeting look. I do wish we could see more of her casual style – mainly for my own selfish styling reasons! I found the same thing with those shoes. They are killing me! I hope they are worth the pain. I agree… Bring on casual looks for my own selfish reasons too! They look like the Zara basic… But so many look similar. Nice classic look! I spotted some Me & Em pieces today at Nordstrom Rack. 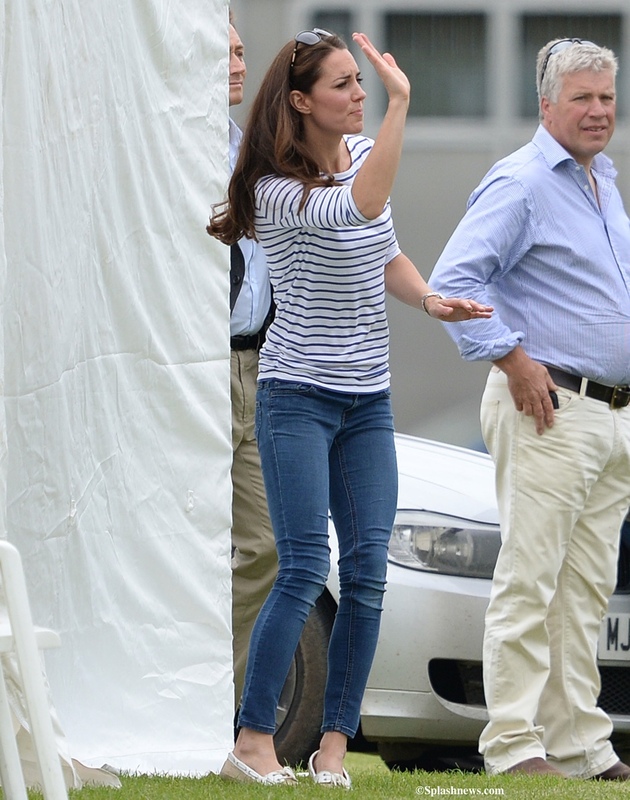 It’s fun to see that Kate has a uniform – Breton top, jeans, Sebagos. 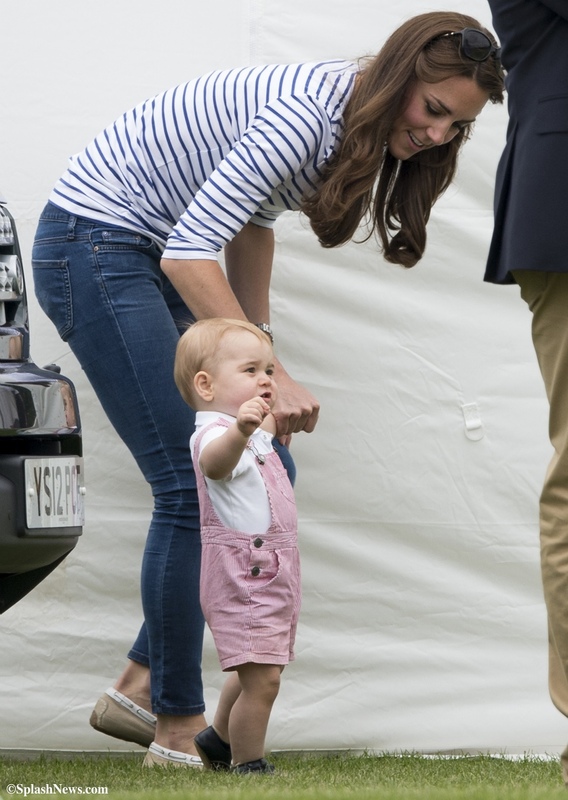 Also, Prince George looks like he’s almost grown out of those overalls! I think the jeans may be these. The weird thing about the page is that the last photo shows holes, but none of the others do, so if you ignore the last photo, which might be a Zara webpage error, it looks pretty close to me.